Owned and operated in the desert since 1984 by Sang and Yon Kahng, Palm Desert Cleaners began as a small 2 person operation and grew into a team of 20+ members lead by Manager, John Kahng, who expertly fulfill the various processes of professional dry cleaners from customer service to spot cleaning and pressing. 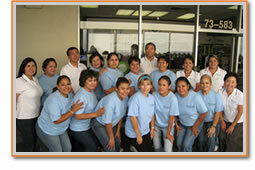 Every garment we handle receives individual attention and tender loving care. We take the time to inspect each article of clothing throughout the entire cleaning process. Our personal touch and attention to detail helps extend the life and beauty of your clothes. We are also the only dry cleaner in the area that specializes in Hand Finished Shirt and Linen Service! © 2009 Palm Desert Cleaners. All Rights Reserved.